The HER Foundation relies on the generous contributions of others to carry out its mission of advancing HG research, providing education and support to those seeking effective management strategies for hyperemesis gravidarum (HG). The following are other ways you support HER while also directly benefiting. Proceeds from these purchases will be used to fund our research and education projects. Order now and 100% of the money will go to the HER Foundation to help continue raising awareness. To read reviews, visit amazon.com. 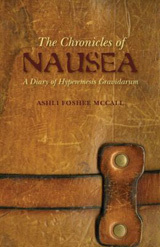 The latest book on Hyperemesis Gravidarum, "Beyond Morning Sickness" by Ashli McCall is a must read for all HG sufferers and survivors. Looking for an innovative way to support HER? Purchase $10, $25 and $50 gift cards through the www.pvodagifts.com website. This is a very cost effective fundraiser since there is no additional overhead or expenses. Each purchase that you or your friends make through this website for our program will help generate needed funds at no cost to our organization. The HER Foundation receives a significant percentage of each sale and you can purchase hundreds of terrific products for you, your home, your family and your friends. You can choose everything from candles, tools – or any of the nearly thousand gifts for you or any member of your family. You can shop online from the comfort of your own home in a secure environment and most importantly you will be supporting the HER Foundation. If you forward this link on to your family and friends and they purchase gifts cards using our link, we will be credited for those sales too! This is a simple and fun way to help us raise funds. Marianna Leman, an Arbonne Independent Consultant, has agreed to donate to the HER Foundation 35% of all retail volume generated from the HER Foundation web site. Visit www.marianna.myarbonne.com. Click the Login link (shown below) and use the following Client Login Arbonne ID: 17058455. Once you are logged in, the page will read "Welcome, HER Foundation". Choose your products, proceed to checkout, edit shipping information and print your receipt. You can also contact Marianna directly at 321-693-2087 or via email at .